"Thanks for your help! My wife LOVES the clock, and so does my baby daughter. Great quality for the money. Will order from you again and recommend you to others...G.S. TN"
"Easy to find what I wanted, easy to order, prompt action on my order, and smooth delivery before Christmas. Could not have asked for better service. "I just wanted to take a few minutes to thank you for the beautiful clock. I recently purchases item #NA200 as a Christmas gift for my dad and step-mom. We had always enjoyed the sound of the cookoo clock. My dads cookoo clock died a few years back and we had since missed that sound. Just browsing the internet, I discovered your webpage. My siblings and I decided this would be a nice present to give back to a father that has given everything to us in life. Wow to see the excitement in his eyes as they opened the box on Christmas will never be forgotten. It is very beautiful. The details are incredible. I hope they enjoy it for years to come. I plan on getting one for my family this year so my kids can enjoy the same thing I did growing up in my parents house.Thanks S.D.,UT"
"everything about the purchase and delivery went well. I would buy from them again without hesitation.M.R.,CA"
"Great site layout with easy navigation and straight forward pages. It was very simple. I would recommend this site to others who are interested in buying high quality cuckoo clocks.J.W.,WA"
"As advertised, promptly shipped, received A-ok. A pleasureable shopping experience.J.R.,SC"
"Everything went as promised. Everytime I had questions I received a prompt answer.R.D,NY"
"This was a quality company to deal with. I needed my item quickly, as I was behind with my Mothers Day shopping, and requested two-day delivery. excellent customer service!my mothers Mothers Day was saved.T.R.,OR"
"The largest selection of Cuckoos in the United States. Fast shipping. Excellent descriptions and photos. R.D., MA"
"A EXCELLENT PROFESSIONAL SELLER THAT HANDLES REQUESTS MADE BY THE PUBLIC EFFICENTLY AND QUICKLY. A TRUE PROFESSIONAL. I received the "moving birds" Hekas clock on Tuesday, around 2:00 PM. It is a real nice clock. I opened the box, right away, at work . I showed it to a couple co-workers and they were really impressed with it. I think the variety and quality of the current cuckoo clocks is amazing. I can hardly wait to buy another one. I now have the clock on my hallway wall, in place of another one, and it looks great, and works well. I am very happy with it. Your extra packaging of the inner, smaller box, was excellent. Your website is the best one I have looked at. I wonder if your company has any sort of showroom. It is difficult to tell from a 2-dimensional picture exactly what the clock will look like upon arrival. I don't know of any company around which sells new cuckoo clocks, so for now, I am relying on the internet. I would prefer to physically look at some prior to purchasing. Thanks for answering my previous e-mail about the Hekas clock I purchased. I have a couple more questions about other clocks, so I'll e-mail again, soon. There's over a hundred people who work at Container Research, and I am sure word will spread about the clock I received there. I'll try my best to tell everybody about your excellent company. 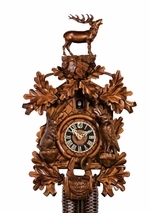 I'd like to purchase clocks for each of my family members, hopefully from My Cuckoo Clocks.